Innovating In Leadership And Leading Innovation: What Are The Keys To Both? 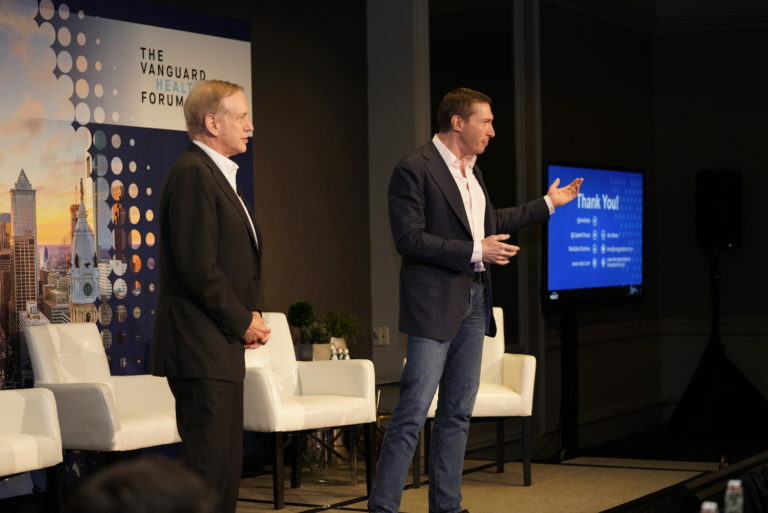 Glen de Vries, president of Medidata, and Ken Banta, founder of the Vanguard Group for Leadership, co-chaired the Vanguard/Medidata Forum on Innovation Leadership in Philadelphia in June. I asked them about how leaders can drive innovation in their organizations, and I am sharing that dialog here. Glen has been president of Medidata, the leading cloud platform for life sciences research, since the company’s inception in 1999. He brings a background in molecular biology and genetics and his experience as a research scientist to his leadership role. Ken is the founder and principal of the Vanguard Forums, which uniquely address the critical leadership development needs of next-generation leaders. Ken also advises CEOs and executive teams on leadership and organizational transformation. What does it mean to be a leader in innovation? Glen de Vries: You need the horsepower to solve the problem, a team that believes they can do it, and a sustainable business to deliver the solution. In our case, we were able to replace custom built systems for each clinical trial with a platform that works with all. Now we are tackling data aggregation across companies. Ken Banta: Glen’s example applies beyond science and technology. Innovation leadership is doing something new and better for customers or your own organization. It’s applied smarts. What does it mean to innovate in leadership, and why is that important today? Glen: Ideas are important but execution is really what delivers. You must assemble the right team. If what you are doing is truly innovative, you won’t be able to find exact prior experience. There had never been an effective data strategy in clinical trials, so we recruited our chief data officer from the insurance industry. Ken: Peripheral vision is a trait of great leaders. To master complexity and rapid change, you need to have a team around you with experience venturing into the unknown. You won’t find someone who already has the exact job. Look for people who bring it in laterally. How should top leaders organize their teams to foster innovation? Glen: Consider the concept of agility versus hub and spoke and waterfall processes. The agile model, which came out of tech and aerospace, demonstrates that a team needs to be empowered to make decisions, able to communicate in nearly real time with each other, and constantly iterate customer assumptions. Every week at Medidata, we sit down and talk about we’re doing. We correct in real time. A long-term view ahead is important but sticking to a five-year plan is out the window. Ken: As a leader you have a choice. You can have a leadership group that is a set of autonomous people and report in. Or you can have a team that is accountable as a group. With the first, there is reporting and jockeying for budget but no real accountability. Successful top leadership for the future depends on collective responsibility and accountability. This means, for example, that the head of commercial will see that a certain R&D program is critical to success, and then cede some budget to make it happen. It’s the CEO who sets the tone for that to happen. When it comes to working with the board, what are the key leadership qualities and actions of a successful CEO? Glen: The board’s role in governance is vital and must remain the same. The board provides scrutiny, guidance and approval. It’s the CEO’s responsibility to help the board identify the atomic pieces of information and see the forest for the trees. Not every tree—that’s our job—but the big picture. Ken: Today’s active board has become even more engaged. For example, sexual harassment has woken up a lot of boards. Great leaders have learned how to work with the more active board. They invite board members in to learn more about the company, exposing next generation leaders to the board. This activism is here to stay, and CEOs must adapt. CEOs should especially stay in tune with the frontline people because they do the work, and know what is going on. But how do you do that efficiently and effectively? Glen: I’m not a fan of email-based management. You have to get out of your office and work at all levels of the organization. A critical skill in a complex business environment is the ability to judge what’s important. As a top leader you must show the way. Demonstrate how the organization’s thought processes should work. Keep the knives sharp. Find opportunities or excuses to get down into some of the critical details—lead by example. A senior exec can’t rely on traditional command and control. If you wait for things to be reported up, you will not see what is actually happening. Ken: Great leaders resist listening only to the people in their immediate circle. You have to meet with people at the front lines wherever you go. Make them feel accountable and respected by top leadership. You will learn a lot about what’s going on from the sales force. I recall a situation where a CEO only discovered that a pivotal product was at patent risk by talking to people closer to the working level. Culture, strategy and execution—all three are critical. How do you rank them in importance? Glen: They serve different purposes and all are critical. But I believe culture is the key. You can buy strategic ideas, and you can bring in execution expertise. You can’t buy culture. Culture is having your people motivated and aligned to make the right decisions. If you have a culture where the only thing valued is ultra hard work and flawless execution, you will burn people out. They need to understand what they should be doing and why. Ken: I find that what is often neglected in practice at top levels is execution. Executives talk a good game about culture, and it is very important. But a great leader puts a razor-sharp focus on excellent execution. It’s quite a challenge. You don’t want to be a micro manager. Neither do you want to be a delegator. An ‘ok’ strategy executed with excellence, can have surprisingly good results. Great strategy executed badly won’t make it very far. Looking forward, what will be the most important development for innovation in healthcare? Big data? Patient engagement? Something else? Glen: There’s a heavy burden on healthcare, because people’s lives are at stake—one life or a million lives. You can’t just shoot from the hip like you might in another industry. It’s easy to get distracted by ideas like big data and blockchain but we need to think about convergence. We need agile and new thinking, a matrix of experience, creativity and moonshot ideas that are grounded in scientific principles. Embracing it requires organizational discipline as well as the ability to be creative and disruptive. Ken: The future of healthcare is the convergence of various sectors that previously were separate. No one knows where it’s going to go, but it will be very different. The cliché is that Amazon will take over. There will be new entries, new players. The bellwether of this is the acquisition of Aetna by CVS. The essential capability will be to manage complex systems and to generate ‘small company’ innovation inside very big companies. The delegates at the recent Vanguard/Medidata Forum on Innovation represented various senior functions in healthcare. What do you think they learned from each other? Glen: Delegates brought a lot of experience to the day. It was a 400 level class. Important themes were addressed, such as how you think about strategy and culture. I can now be more articulate about them. Before, I had glimpses, and my instincts were reinforced, so I can take concrete action. Ken: What I found interesting wasn’t just what they learned, but how. I heard several delegates say it was an intimate and trusting environment. Not grandstanding from the riser, but people exchanging deep experience and learning. Faculty told me that they learned as much as attendees.